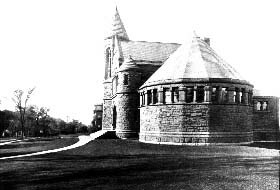 Prominently located on University Place overlooking the University Green, the Billings Student Center was originally constructed between 1883 and 1885 as the Billings Library to the design of one of the country's most influential architects of the era, Henry Hobson Richardson. Other noteworthy examples of H. H. Richardson's works include: the State Capitol in Albany, New York; Trinity Church in Boston, Massachusetts; Allegheny County Courthouse in Pittsburgh, Pennsylvania; and Sever Hall at Harvard University in Cambridge, Massachusetts. 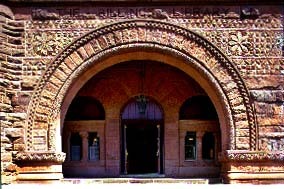 Billings is an outstanding example of the Richardsonian Romanesque style of architecture. 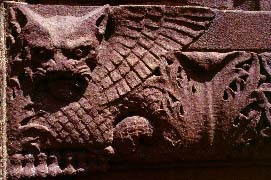 Important architectural features include its imposing reddish-brown sandstone exterior with beautiful carvings, the monumental arched entrance opening, the black slate roof with "eye-brow" dormers and the two stone towers. Inside, the building features an imposing entrance hall with a sandstone fireplace. Above the fireplace is a large portrait of Frederick Billings of Woodstock, Vermont, the main benefactor for the building's construction. Many of the original 1885 gas lighting fixtures remain, although the building was electrified in 1911. H. H. Richardson also designed the original furnishings for the library including the tall intricately carved wooden clock that stands in the main hall near the fireplace. The front steps and the surrounding landscaping were designed by the firm of Frederick Law Olmsted, who designed Central Park in New York City. In 1889, the library was extended 25 feet to the north to accommodate more volumes of books in the stacks. At the same time a forty-by-forty foot Marsh Room was added to the east. This space with its beautify sandstone fireplace was named for George Perkins Marsh of Woodstock, known for his pioneering work on environmental issues during the mid-1880s. 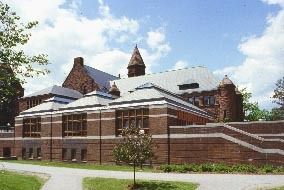 With the completion of the Guy W. Bailey Library in 1961, the Billings Library was renovated and transformed into UVM's main student center, opening in 1963. From July 1984 to March 1986, the building was closed for renovations and the construction of a large addition that connects Billings with the Ira Allen Chapel. A large student dining facility was added, along with offices and meeting rooms for many student organizations and a large theater that extends north of Ira Allen Chapel. Photo credits: Top, view circa 1890, UVM Archives; others by Prof. Thomas Visser, 1999.